No one on this list has won more awards or has left a greater impression on the world at large with his comedy more then Mel Brooks. How did this young Jewish kid from Brooklyn turned corporal during World War II become the embodiment of comedy he is today? Practice, practice, practice. And doing celebratory impressions. 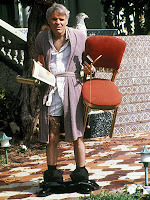 He started off his career on a whim doing stand-up but a series of lucky breaks got him all the way to Hollywood and into the directors chair. 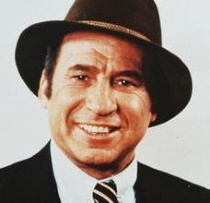 Brooks was really one of the first to pioneer musicals with a satirical twist as well as improving the art of parody. He gained some underground success early on but hit it big in the mainstream with his third film ever, Blazing Saddles. 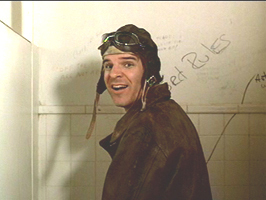 While Brooks was a writing/directing machine, he usually only did short cameos in his films if he was in them at all. But when he took the acting reigns to star in a movie, you knew it would be something epic. 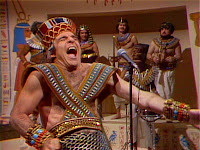 Mel Brooks plays a myriad of roles and his supporting cast are top notch. It’s not Mel Brooks’ most famous film but it is one of the funniest that actually stars him. 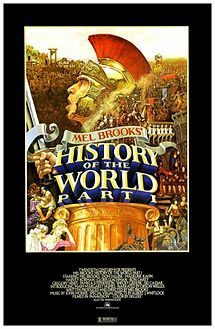 If you like good old fashion dirty jokes and satirical wit, you can’t do much better then History of the World, Part 1. Well, maybe Silent Movie but one Mel Brooks movie to an article, please. 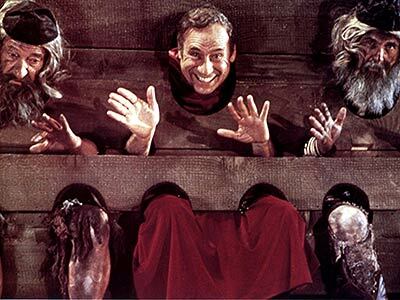 I mean who else could make the stockades look like so much fun. 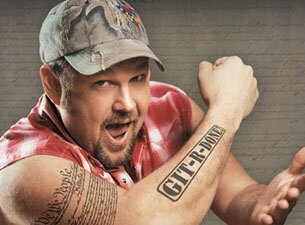 Making fun of Larry the Cable Guy is lot like making fun of someone’s mental disorder. Daniel Lawrence Whitney, the comedian that uses the Larry the Cable Guy persona, is actually very different from the redneck character he portrays. For one, he’s from Nebraska and before he was a comedian, he was a fairly popular disk jockey doing appearances and commentaries on numerous radio shows. But we’re not here for Whitney, we’re here for the catchphrase-spewing stereotype-using monster he’s created. Grab your torches and pitchforks people! Larry was just a part of Whitney’s act before taking over his stand-up altogether. With his “appeal” to the modern man, Larry has grown in popularity enough to have his own stand-up specials as well as lending his incredibly annoying voice to the ‘Mater’ character in Pixar’s Cars franchise. 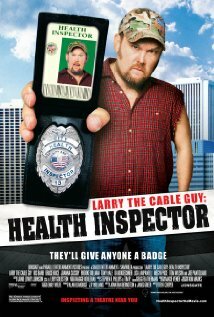 It wasn’t until 2006 that Larry the Cable Guy did something truly horrifying, star in his own movie. Larry plays...Larry, a big city health inspector who’s on the trail of a series of food poisoning cases that are part of a dastardly plan to do...something. 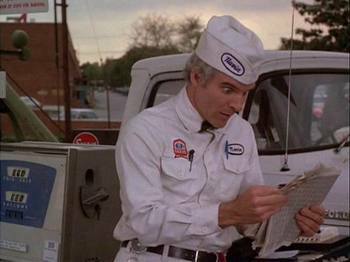 Along the way, Larry, does some “hilarious” schtick such as walking around without sleeves on and pretending to be an Arabian customer. Oh man. Wow. My sides are splitting. Please stop. It’s a stupid premise with stupid characters doing stupid stuff. The jokes are either about farts, Larry’s naivety, or the tired cliche of having a country bumpkin trying to fit in a high cultured society. It’s tired, uninspired and right up Larry’s alley. On the bright side, at least it was acknowledged as the horrible cash-in it was. Universally hated by critics and so bad that it won Larry the Cable Guy the Worst Actor Award from the 27th Golden Raspberry Awards. Congratulations, my friend. You’ve finally made it. How could it not win an award?! 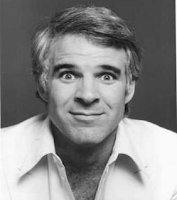 But more then just being a funny guy, Steve Martin pioneered a new genre of comedy. Uncomfortable comedy without a poignant punchline used with ironic self-depravation humor. Trust me, no description can really do the man’s work justice. (He also popularized using “air quotes.” Damnit! You can’t even say “air quotes” without doing “air quotes!”) Steve Martin moved away from stand-up into acting around 1981, but three years prior, he made one of the funniest movies that is still held in the highest regards to date. So Navin grows up feeling out-of-place until he hears a snappy beat on the radio -- the song has an old fashion caucasian beat, of course -- which inspires Navin to go out into the world and find his place. And boy, oh boy, does wackiness ensue. Honestly, I could devote this entire article to the hilarity of The Jerk but I’ll just touch a few of the best bits. Navin gets a job as a gas station attendant and is ecstatic to have his name in the phonebook for the first time only to be the target for a mad gunman who just so happens to like killing random names he finds in the phonebook. And there’s also the infamous “He hates these cans” scene. Navin then gets a job as a weight guesser in a traveling carnival where he is bullied into a relationship with a daredevil biker chick. And then, through an odd series of events, Navin becomes a millionaire due to a tiny invention he created earlier, loses all his money, goes bankrupt and ends up on the street again. 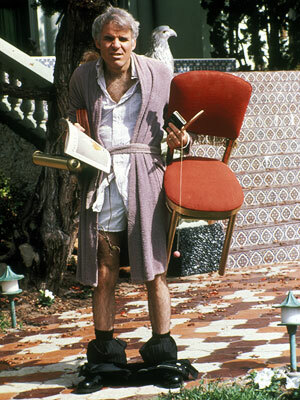 The characters are terrific, Steve Martin is hysterical, and it’s all around just a fun movie. 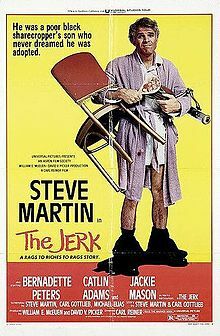 The Jerk, leaving the world a little brighter one gag at a time.